to show you how to fix your own shoulder. While there are many different areas to work on, knowing two of the key areas to focus on will make all the difference in your success. Just take your time, and you'll do great.The techniques I show you are not complicated, but they must be done properly for them to work. Follow along with the videos below and you will most likely be very pleased with the pain relief you can accomplish all by yourself. You can do it! This short introductory video is a great place to start. It will give you a good overview. Freeing a frozen shoulder by yourself requires that I show you how to release both the most important muscles that are causing the problem, but also that I have you work on them in an order that makes it easiest for you to release them. This video gives a review of all the techniques we are about to do in order to free your frozen shoulder. 1. 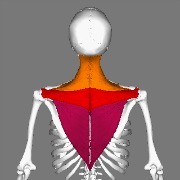 Your trapezius muscle (that attaches to the base of your skull, runs all the way down to the top of your lower back, and all the way over to outer edge of your shoulder blade) plays a critical role in the lifting of your arm when it moves your shoulder blade (scapula) out of the way, so that your arm can be raised without getting jammed in your shoulder socket. 2. Your 11th Cranial Nerve (a.k.a. the spinal accessory nerve) innervates your trapezius muscle. If the nerve is compromised it can stop your trapezius from doing its job of moving your shoulder blade out of the way when you go to lift your arm and be one of the main causes of frozen shoulders. The 11th Cranial Nerve originates in your brain stem and comes out of the hole in the bottom of your skull called your foramen (the same hole your spinal cord comes out of), but instead of going down your spinal column, is comes out in the space between your top two vertebrae. If the nerve gets pinched between your top two vertebrae it will often prevent your trapezius from working properly. So, a main part of these frozen shoulder exercises and treatment is to make sure your 11th Cranial Nerve is free, first and foremost, before we try and do anything else. shoulder blade (scapula) out of the way when you lift your arm. 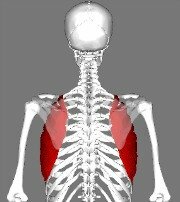 Without the proper action of the serratus anterior it will be difficult to lift your are in certain directions, so we must make sure it free. The main goal in video 2 is to free your 11th Cranial Nerve that innervates your trapezius muscle. Starting at the base of your skull you are going to investigate and survey all the tissue in the back of your neck. You just want to press into the tissue at the base of your skull on both sides. Press into the tissue and feel for painful/tender tissue. When the tissue is painful/tender when you press on it, that means it’s tight. And tight tissue needs to be released so the bones and nerves have the space they need to function properly. You can use your fingertips, or your thumb, to press into any tight tissue you find. Once you find some tight tissue simply do the press-pull-release technique and the press-hold-move technique until the tissue lets go. If the tissue is stubborn and won’t let go, then feel free to move to other tight tissue and inch or two over and work on that for a while. You can work on the rest of your neck and return to the stubborn tight spots or your can go through all the videos and then return to the stubborn tight spots. In my practice it usually takes about 3 rounds of all the techniques I show you in these 5 videos. Doing it yourself may take a few more rounds than that, just because I can always get more done working on someone else than I can when I work on myself, just because the patient can relax while I work on them, and because when I work on someone else I can always get in the optimal position to work on them. When I work on myself it’s not quite as easy to do that. Notice how much this set of frozen shoulder exercises and treatment helped your shoulder. Our goal in video 3 is to free any other tight areas in your trapezius muscle that could prevent it from doing its job of moving your shoulder blade out of the way when you lift your arm. Since you have a frozen shoulder I decided to have you do the tennis-ball-press technique against the wall. You can also do it while lying on the floor, but I think it’s probably much easier to maneuver your body by doing this technique against the wall. First, put a tennis ball in a sock or a pillow case. Hang the sock over your shoulder so the ball in between the wall and your back. Now just investigate and search for tight tissue, which will be painful when you press against it with the ball using your bodyweight. Once you find a tight spot, press the ball against it and do your bend to bend or twist in a way that makes that tissue your are pressing into move underneath the ball. This can be challenging when you have a frozen shoulder, but just do the best you can and you’ll soon get the hang of it. Our goal in Video 4 is to release the second muscle that moves your shoulder blade out of the way when you lift your arm. This muscle is called you serratus anterior. This muslce attaches to the side of your ribcage and sneaks under your shoulder blade and attaches to the anterior medial edge (front edge closest to the spine) of your shoulder blade. When it flexes it pulls your shoulder blade out to the way so you can lift your arm without the humerus getting jammed into your shoulder socket. With the arm of your frozen shoulder being supported by grabbing the front to the opposite shoulder with your hand, bend forward. You can also bend forward with the arm of your frozen shoulder hanging straight down if that position is not painful. Now reach around with your “good” hand and arm and press your fingers into the side of your ribcage where your serratus anterior attaches. 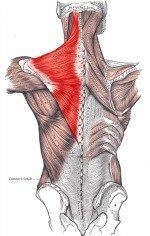 Do the press-pull-release technique and the press-hold-move technique on all the tight tissue you find along the serratus anterior. In the same position do the same techniques on your teres muscles on the outer edge of your shoulder blade. You can do this while bent forward or stand straight up. Try both positions and see what you like. Again, do the same techniques to release your subscapularis muscle that lies between your shoulder blade and your ribcage. You can do this while bent forward or stand straight up. Try both positions and see what you like. In Video 5 we want to free some of the remaining muscles in your shoulder that may be tight and causing you to have difficulty lifting your arm. Now do the same techniques on all the muscle tissue you find on the underside of your clavicle (subclavius, pectoralis major, pectoralis minor). Any tissue that is tight will be painful/tender, but these areas are fairly easy to get at, so just stick with it and you’ll free up that entire area. Now reach around with your good hand and do your deltoid muscles (what most people would call their “shoulder muscles’). Reach around the back, then middle, then front and release all the tissue you can. When working on the front deltoid, after it’s released, press a little deeper and work on the biceps tendon a bit, just to make sure it’s not “stuck” after you shoulder has been immobile for so long. And now, if you're not completely better, go back to video 2 and release those spots that were stubborn the first time around. Now, you may find they've already released or just need a bit more work to be set free. Is your Frozen Shoulder Exercises and Treatment complete? How much improvement did you experience? What techniques gave you the most relief? Are there areas you need to revisit? Make a mental note of what worked best, and what areas you want to revisit. Be persistent and you'll keep improving.